Assassin’s Creed has always been a franchise with a grand vision both in terms of the scale of its worlds and its narratives. Telling a story that has a foot in our present while making history an accurately and respectfully recreated playground is no small task but the team behind Assassin’s Creed has been doing so for over 10 years. Over that decade it has, however, sometimes felt like the development team’s vision was slightly ahead of its time – like they wanted to deliver more than they were able to in the time they had with the tools they were using. Each game has had mind-boggling amounts of research behind it that’s been used to recreate stunning historical locations to an astounding degree of accuracy and make them feel convincing and immersive. However, despite impressive scope and visuals, the games have been repeatedly pulled down by bugs and glitches and the sense of history being our playground has been undermined by arbitrarily locked maps and restrictive, repetitive gameplay. 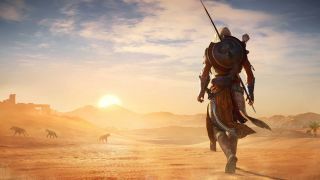 With Assassin’s Creed Origins, Ubisoft is promising to reinvent the series with its biggest, most open game ever. When we sat down with the game’s creative director, Jean Guesdon, he told us that a lot of what the team has managed to achieve this time around is largely down to now having “the tech to do whatever [they] want.” And maybe a little more time. “I’ve been working on [the series] for 11 years now, since Assassin’s Creed 1. We’re dealing with human history, something that’s so rich that the possibilities are endless and we’ve already explored many time periods,” Guesdon told us. Of course, we’ve already seen previous Assassin’s Creed titles on current generation consoles, but it’s the new 4K and HDR capabilities of the PS4 Pro and Xbox One X that appear to have the Assassin’s Creed’s art team excited. During a press presentation, the game’s art director Raphael Lacoste was keen to point out the importance of lighting in recreating an Egypt that felt real. The region’s relatively flat landscape, he said, meant that a stark contrast between light and shadow were important for creating depth and really highlighting the brightness and heat of the sun. The HDR support being offered by new consoles must, then, be exciting we posited to Guesdon. There have, of course, also been internal technology advancements that have helped, namely in the Anvil game engine. Anvil is Ubisoft Montreal’s proprietary engine that’s been used in its various forms to develop all of the Assassin’s Creed games. Given that the team is excited by advancements in development technology, we wondered whether the Assassin’s Creed team would be interested in using it to develop for new platforms. The new Discovery Tour game mode, we suggested, has the potential to lend itself particularly well to virtual reality. Sadly, a virtual reality mode isn’t in the immediate future for the Assassin’s Creed franchise.